ADS-B is one of the most important, underlying technologies in the agency’s plan to transform air traffic control to a satellite-based system. It is an air traffic system that will provide more precise surveillance data to air traffic controllers and to ADS-B equipped aircraft at the same time. This information will significantly enhance pilots’ situational awareness. This technology provides more precision for tracking aircraft than radar by giving the location, identification, heading and speed. In addition to the surveillance data (traffic) being provided, it will also broadcast weather information to properly-equipped aircraft. ADS-B will bring the precision and reliability of satellite-based surveillance to the nation’s air traffic controllers and pilots. ADS-B uses Global Navigation Satellite System (GNSS) position information processed by aircraft avionics to transmit the aircraft’s location to ground receivers for presentation to air traffic controllers. Pilots with ADS-B avionics will receive traffic and weather information on their cockpit displays. Controllers will see the information on automation displays they are already using, so little additional training will be needed. 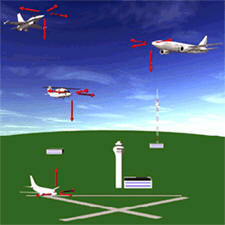 ADS-B signals are transmitted once per second, providing a more accurate tracking system for pilots and controllers. With ADS-B, pilots for the first time will see the same kind of real-time traffic displays that are viewed by controllers. This will dramatically improve pilots’ situational awareness, since they will know where they are in relation to other aircraft, bad weather and terrain. This technology is already showing benefits in safety. In Alaska, there was a substantial drop in the accident rate of aircraft equipped with ADS-B avionics. United Parcel Service voluntarily equipped its aircraft with ADS-B cockpit displays, and is saving time and money on flights to and from its Louisville hub due to the improved efficiency available with satellite technology. In addition to improved safety in the sky, ADS-B will help reduce the risk of runway incursions. Both pilots and controllers will see the precise location on runway maps of each aircraft and equipped ground vehicles, along with data that shows where they are moving. These displays are clear and accurate, even at night or during heavy rainfall. ADS-B will also increase capacity. More accurate tracking could eventually allow aircraft to fly safely with less distance between them. Because ADS-B accuracy also means greater predictability, air traffic controllers will be better able to manage the air traffic arriving and departing from congested airports, resulting in even more gains in capacity. With its combined increases in safety, efficiency, and capacity, and reductions in cost, ADS-B is critical to the agency’s Next-Generation Air Transportation System. Radar technology is essentially a product of 1940s’ World War II technology. Radar occasionally has problems discriminating airplanes from migratory birds and rain “clutter.” Secondary surveillance systems can determine what objects are because they interrogate transponders; however, both primary and secondary radars are very large mechanical structures that are expensive to deploy, require extensive maintenance, and require the agency to lease land on which to situate them. ADS-B, on the other hand, receives data automatically from the aircraft, rather than scanning for input like radars. ADS-B ground stations are inexpensive compared to radar, and are considerably smaller. They take up less space and can be located practically anywhere. In addition, ADS-B updates once a second and locates aircraft with much higher precision. ADS-B also provides greater coverage, since ADS-B ground stations are so much easier to place than radar. Remote areas where there is no radar now, like the Gulf of Mexico and parts of Alaska, will have precise surveillance coverage with ADS-B. Who will install the ground stations? The FAA has begun implementing ADS-B in the national airspace system. This means expanding the current infrastructure within various portions of the U.S. The agency is managing the ADS-B radio station deployment, surveillance from the radio stations that are being integrated into the FAA’s current air traffic control systems and the avionics standards. ITT Corporation was selected in August 2007 as the prime contractor for the deployment of the ADS-B radio infrastructure. Under the terms of its contract, ITT must have the system ready for commissioning by 2010 and enough stations in place by 2013 to provide ADS-B coverage everywhere there is radar today. As the ADS-B radio infrastructure expands, ITT, Corp will likely use the system’s capabilities to offer commercial services to private pilots and airlines. The agency issued a notice of proposed rulemaking in 2007 asking for public comment on the avionics necessary for implementing ADS-B across the national airspace system. Under the proposal, operators would equip their aircraft with avionics based on the airspace in which they plan to operate. The FAA expects to issue a final rule by spring 2010 that would mandate ADS-B avionics in certain airspace by 2020. With national coverage complete by 2013, benefits in improved safety and capacity, and better efficiency for users, will accrue as more and more users equip. In December 2009, the standards were approved for ADS-B avionics. Approval of the minimum operational performance standards (MOPS) and related Technical Standard Orders (TSOs) gives vendors and operators assurance that the equipment meeting those standards will fulfill the requirements of the ADS-B rule. Where is ADS-B being rolled out? ITT has installed 11 ground stations in South Florida. Aircraft equipped with ADS-B avionics now have weather and traffic information broadcast to the cockpit for free and controllers in that region will be using the system to separate aircraft in the future. These services also are being provided in Louisville, KY for controllers and pilots. Pilots in the Gulf of Mexico now have enhanced communications and weather services while controllers at Houston Center are using ADS-B for separation services. This will also be available in Philadelphia in February 2010 and Juneau in April 2010. To prepare for the national commissioning slated for September 2010, the agency is implementing ADS-B at several key sites. Controllers began using ADS-B to separate and manage aircraft in Louisville on November 19. Louisville was chosen as a key site in part because UPS voluntarily equipped its aircraft with ADS-B capable avionics. This surveillance service became available on December 17 at Houston Center for operations in the Gulf of Mexico. The FAA brought ADS-B to the Gulf following a Memorandum of Agreement with the Helicopter Association International (HAI), helicopter operators, and oil platform companies. This will greatly improve the safety and efficiency of aircraft flying over the Gulf, since radar coverage does not extend over water. Controllers tracking aircraft flying over the Gulf must rely on reported — not actual — position information. In order to keep aircraft safely separated, a significant amount of airspace must be “sanitized” around each aircraft, severely reducing capacity. At low altitudes, individual aircraft are isolated in a 20-mile-by-20-mile grid. At high altitudes, commercial aircraft are separated by as much 120 miles in-trail. Under the agreement, the FAA is getting valuable space, power, and telecommunications where available from the oil platforms to the shore for the ADS-B ground stations, weather stations, and the radio communications stations installed by the FAA. The FAA announced a dual link decision using the 1090MHz ES and UAT mediums for ADS-B, and has proposed a mandate that all aircraft have ADS-B Out capabilities by January 1, 2020. At AOPA's recent Summit meeting and convention, questions were put to some industry experts (including Garmin) about ADS-B and here's what they had to say.